Motel One has opened its second hotel in Switzerland: Motel One Zürich. The 394-room hotel enjoys a city centre location and unusual design themes inspired by Switzerland, Lake Zurich and chocolate, which reflect the city’s prominence and elegance. “Working with our partner Swiss Prime Site Immobilien to transform the old Selnau post office at this special Zurich location into a sophisticated design hotel was a particular challenge,” said Dieter Müller, chief executive, Motel One Group. “In our view, the result is extremely successful. 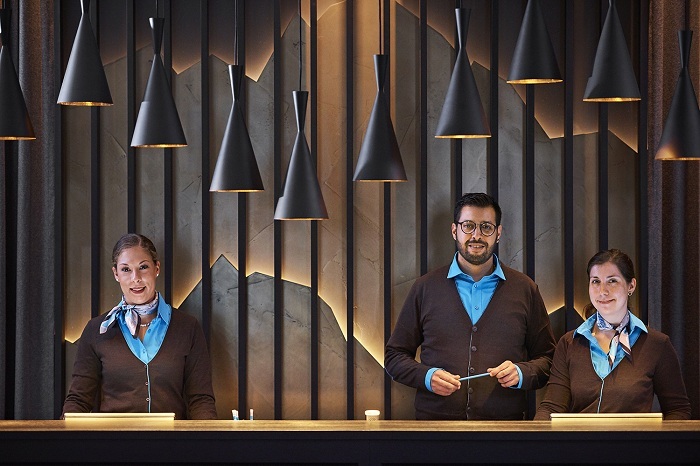 Guests are aware of the local inspiration from the moment they enter Motel One Zürich. An elegant gold panorama of the Swiss Alps glows behind the reception desk in an impressive setting. The mountain silhouettes are framed by high-quality loden curtains made by Swiss firm Christian Fischbacher. Lake Zurich is in evidence in the breakfast area, which extends onto the spacious courtyard terrace in fine weather. Airy and light, with delicate clouds on the walls and images depicting the famous lake give guests a glimpse of the breath-taking Lake Zurich landscape. The adjoining area features a large workbench – perfect for working and meetings. Free high-speed Wi-Fi makes the One Lounge a relaxing place to work. Even the bedroom decor incorporates design elements inspired by Lake Zurich and the Swiss mountains. The focal point – a high-quality box-spring bed – is framed by the Alpine silhouette and fine walnut wood, and the rooms are equipped with an LG 43-inch TV, a comfortable leather armchair from Freifrau and velvet curtains from Swiss company Christian Fischbacher.